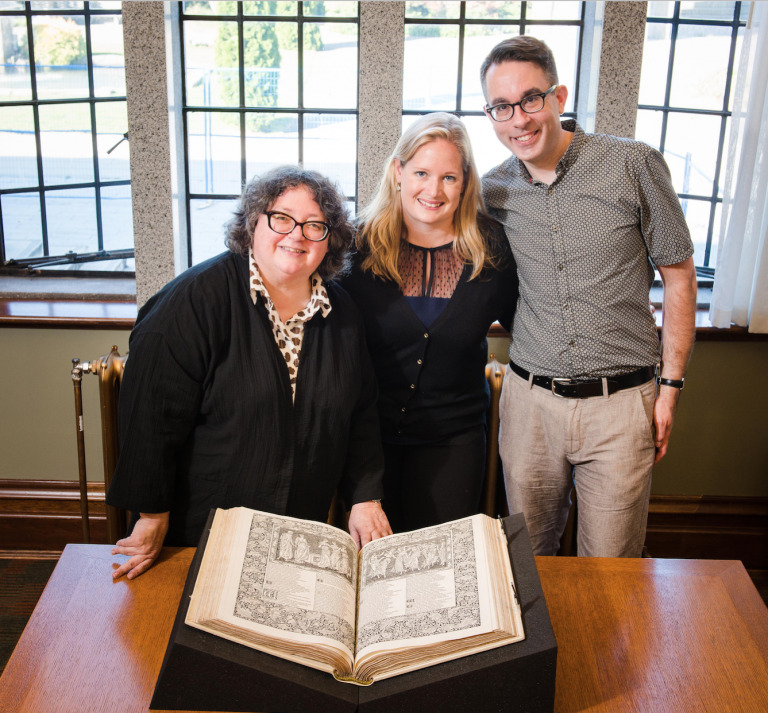 Melody Burton, Head Librarian, Katherine Kalsbeek Head of Rare Books and Special Collections and Dr. Gregory Mackie, assistant professor in UBC’s department of English. UBC Library has acquired of one of the world’s most extraordinary books. With the acquisition of the Kelmscott Chaucer, UBC joins the likes of Oxford, Stanford, Cambridge, Princeton and other top ranking universities. Purchased for $202,000 USD, the book is one of UBC’s most valuable holdings within Rare Books and Special Collections (RBSC). It joins other famous books at RBSC, such as the Second Folio of Shakespeare, donated by Walter Koerner in 1960, and bolsters the library’s world-renowned Colbeck Collection of 19th-century literature, which includes several extremely rare Kelmscott Press books. A joint acquisition by UBC Library and the faculty of arts, the Kelmscott Chaucer was purchased after two years of fundraising efforts, which included a substantial donation from the B.H. Breslauer Foundation of New York. “There was an amazing show of support for bringing this book to UBC.” said Kalsbeek, noting that UBC faculty, community members and UBC’s Centennial Initiatives Fund also made contributions toward the acquisition. Perhaps most exciting is what this acquisition means for UBC students. “Our faculty has expressed real interest in incorporating the book into their course material, whether they’re teaching Chaucer or teaching book design,” said Kalsbeek.